Last week, I went to the bookstore, and I bought myself a copy of Mouse Guard: Fall 1152, by David Petersen. The concept of Mouse Guard is simple. It's the fall of 1152, and mice are anthropomorphized and live in a fantasy setting that has (so far) no humans. So there's swords and castles and fighting, and the big giant monsters that would usually be dragons are animals that prey on mice, like snakes and crabs. 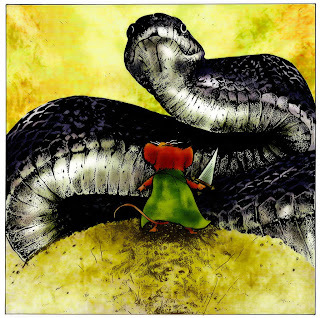 The Mouse Guard defends the kingdom from such threats. This particular book takes place a couple of years after the Mouse Guard fought for the mice's freedom from the Weasel Warlord. The plot, as it is, is pretty generic. The three mice on the cover - from left to right, Lieam (the young one), Kenzie (the leader), and Saxon (the angry one) - discover there's a traitor in the kingdom, and uncover a plot to overthrow their Queen Gwendolyn. Along the way, we learn the history of the kingdom and meet some more characters, including the Black Axe, the kingdom's greatest warrior. That's the basic plot, but like a lot of fantasy stories, the plot isn't the point of the book. Rather, it's about building the world in which the story is taking place, so it's about giving us a sense of place, a sense of the Mouse Guard and how they work, and the threats they face. In this respect, the book is nothing short of wonderful. The introduction of the elements of this world is generally not heavy-handed with a ton of exposition; rather, it shows us the world in bits and pieces, discovering it as if we were actually visitors taking a selectively guided tour. 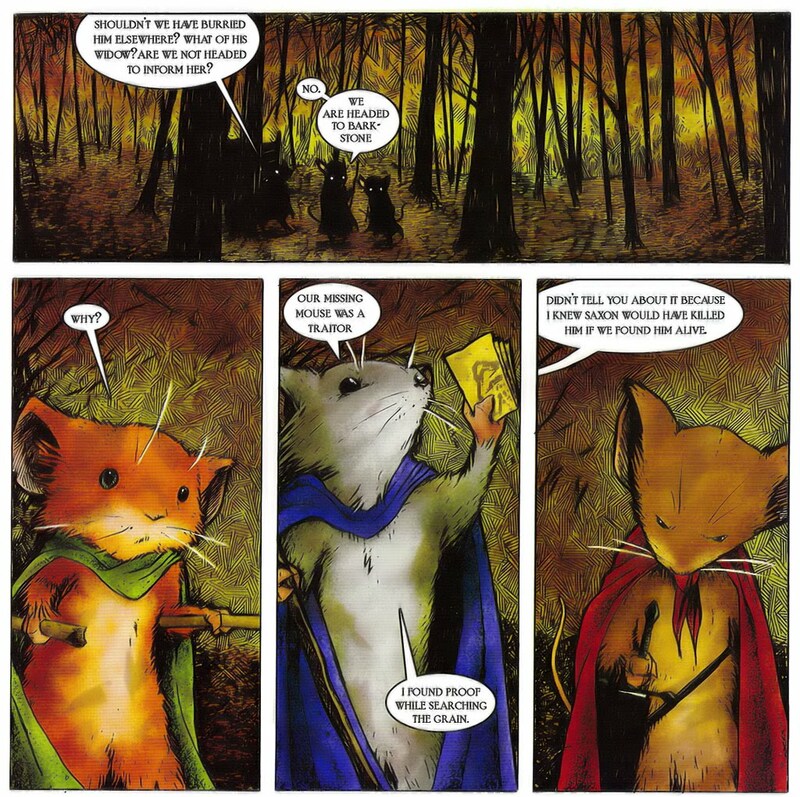 Discovering little mundane things such as how mice get their supply of grain and how mice travel across a body of water (I won't spoil it for you) is the kind of tiny little touch that really authenticates the world-building that Petersen attempts to do. 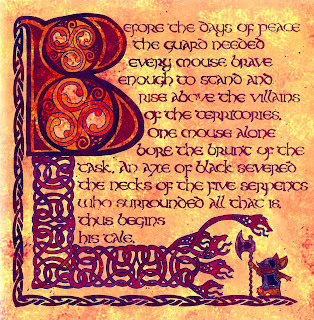 There are also oaths and proverbs, really giving shape and texture to the setting of Mouse Guard. I mean, when's the last time a snake actually looked threatening, in a comic book or any other medium? And even in the event when exposition is absolutely necessary, Petersen transforms it into a calligraphic work of art, worthy of Todd Klein. It's stuff like this that makes the book worth reading and rereading. Heck, if you want, you can just look at the pretty pictures. It is seriously worth the money. I also want to talk a bit about the production of this book. It's printed on high-quality paper, making the coloring really pop out, and the coloring is top-notch and not distracting, as you can see from the examples above. Moreover, the book is 8x8 instead of standard-sized, and I can't help but feel that maybe Petersen is anticipating the translation of this book on digital media. It's the type of comic that would fit on your computer screen, and I know this because I'm holding the book up to the monitor right now. Doesn't take anything away from the book, and would enable any translations to digital media to be easier than most other comics. If there's any complaint I can come up with in the book, it's that it's too short. I want more. I feel like the personalities of the characters are pretty one- or two-dimensional, mainly because there are so many of them to fit in in such a short time. As a result, the story ends too quickly and you end up wanting more elaboration and exploration of the characters themselves and perhaps more time devoted to the plot and implications and effects. 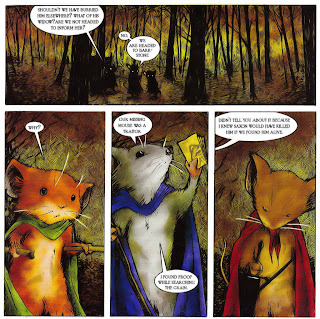 In fact, in the original issues of Mouse Guard, the epilogue, depicting what happened after the big climax, was not shown. The epilogue (as well as things like a map of the kingdom) is exclusive to the collection, meaning that if you bought this in its original issues, it would build up to a big giant fight, then the big giant fight happens, and it would end, and... that's it. Not exactly a very satisfying conclusion. I can forgive that, though, since it seems that the whole point is to set up the pieces for future use while giving a story enough to tell us what the characters are all about. I'm certain that more dimensions will be added to these characters in subsequent volumes, and I quite frankly can't wait to read them. Now, some of you may think that the nature of the story - anthropomorphized mice in a fantasy setting - makes it a perfect comic for kids. Well, guess what? 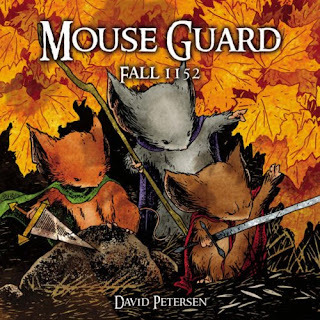 In 2008, Mouse Guard: Fall 1152 as well as its sequel, Winter 1152, won the Eisner Award for Best Kids' Publication! So with that in mind, let's check in with the Comics Cube! 's Resident Kid, Tristan! I showed Tristan some preview pages of Mouse Guard, and he was intrigued, as I was, by the fantasy setting. The fact that mice were the main characters didn't make him question the coolness of the book at all. After all, this is a kid who likes war stories about ancient times, so the subject matter really grabbed him. He was hooked by the middle of chapter 1 (the snake page up above), and commends the art, calling it, in as matter-of-fact a manner as possible, "Great." Moreover, Tristan says the world built by Petersen is full, rich, and believable, and felt, as much as I did, that he was a tourist visiting the world of Mouse Guard. He was, however, a little disappointed with the story. He shares my same gripe in that it feels too short, but also feels that the reveal of the "traitor" was more or less anticlimactic. Still, he can't wait to read the sequel, and he understands that it's a world-building book. He's already rated it as his favorite comic book next to Jeff Smith's Bone. Mouse Guard has a sequel, Winter 1152, and is also now coming out with Legends of the Guard, which showcases various members of the Guard in short stories by different creative teams, including the one and only Gene Ha and Jason Shawn Alexander. It was actually this that got Mouse Guard my attention. If it can attract all these artists, it must be worth looking at, and trust me, folks, it is. Mouse Guard's Official Web site is here, while David Petersen's blog is here. This may possibly be my best find of the year; if not, it's certainly up there. As such, I more than highly recommend it. If you like fantasy, if you have kids you want to get into comics, or if you just plain, flat-out like great art and a good story, this is the book for you. Like I said, decades from now, people will still think this is a beautiful piece of work. I WAS FLOORED! David Petersen definitely has a winner on his hands. I not only bought this volume, but bought the Winter 1152 tome the next day. Have you bought the Winter volume yet? I haven't bought Winter 1152 yet - I was going to wait for the paperback to come out, but apparently there will be no more paperbacks, and the hardcover is just a little too pricey and budget is a little tight. Still, it's on my "to-buy" list and I'll get it eventually!